Egypt's military ruler says the army will hold a referendum to immediately give control of the country back to civilians if there are enough demands for one, a report says. NEW YORK ( TheStreet) -- Egypt's military ruler said the army will hold a referendum to immediately give control of the country back to civilians if there are enough demands for one, according to The Associated Press. The country's military leader, Field Marshal Hussein Tantawi, said in an address to the people that Egypt's presidential elections will be before June 30, although he didn't specify further about the date for a transfer of power, the AP said. 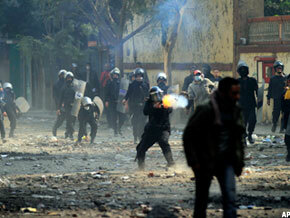 An Egyptian riot police officer fires tear gas on Tuesday during clashes with protesters near Tahrir Square in Cairo. Earlier Tuesday, there was a deal struck by Egypt's military council that included a new constitution and a civilian cabinet with a technocrat prime minister rather than a politician, The New York Times reported. This deal didn't set well with the more than 100,000 protesters who gathered in Tahrir Square in Cairo. They chanted, "We are not leaving, he leaves," referring to military leader Hussein Tantawi, the AP said. This is the fourth day of protests in Cairo. Twenty-nine people have been killed during protests aimed at getting the military to relinquish power, the AP said. The protests are taking place less than a week before the first parliamentary elections since Egyptians toppled President Hosni Mubarak in February. "Please calm things down," Prime Minister Essam Sharaf told reporters, adding, "Egypt must come first and it is important that we protect it at this point." Egypt's Cabinet, appointed by the military, offered to resign on Monday. Three Americans students studying abroad at the American University of Cairo were arrested outside the school's campus, the AP said. The school, which is located in Tahrir Square, has been in touch with families of the three as well as the U.S. Embassy.